Because I am researching my journey through my earlier writings on metadata and interactive story telling I came across my ‘review’ of NAB 1998 thanks to the Wayback Machine. This was the year everyone was coming to terms with ATSC – digital broadcast – and how it was to be implemented. From my review it seems my attention was on interactivity and QuickTime 3, neither of which is surprising. Imagine having the choice of multiple camera angles on a major event (driving directors of such events to distraction) and choosing which one to watch. On a wide screen (16×9) display, miniatures of all 4 might be down the side of the screen real estate and the chosen one on the main display. Of course, that never happened, although we are getting closer to it with Over The Top (OTT) delivery. Premiere was brand new at version 5, although we were still to experience the 5.1 A, B & C that followed a complete code rewrite. DVCPRO was the hot new camera format, and Cinema 4D impressed me for the first time. My two biggest disappointments were the almost complete lack of ‘real’ QuickTime 3 support (beyond single track video and audio) except for one new product in alpha – Roto, and virtual sets. Sadly Roto never achieved it’s potential and faded away without seeing the light of day. Virtual sets took longer to take off, but have definitely become established techniques today. And finally, my first view of Final Cut – still a Macromedia app – where I caught this T shirt at the last demo of the show. My 1998 spoils. I still have this T shirt. Finally, Macromedia was showing Final Cut, not exactly behind closed doors, but certainly you had to know where to find it. Upon traipsing away from the exhibition on the ground floor of the Sands exhibition center, through the large cafeteria area into the ‘meeting room’ maze, some small signs directed to room D12. Upon arriving just in time for the very last demonstration I wasn’t sure I didn’t need a secret handshake to gain entry! 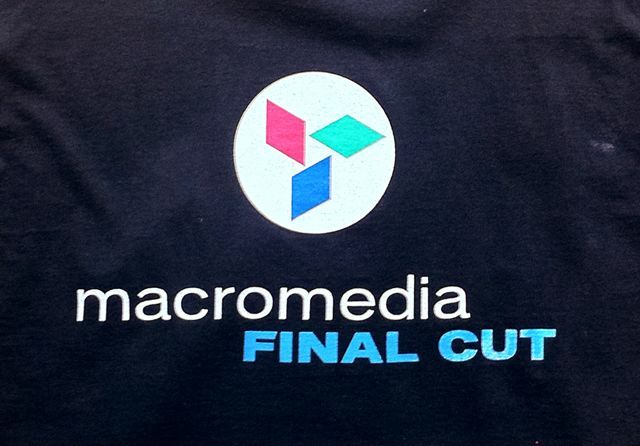 If Macromedia had bought Final Cut to market a year ago, or even 6 months it would have been a Premiere killer. It still might give the veteran a run for its money as it is an awesome application with many features I’ve been wanting desperately on our Media 100 system. (Emphasis added today.) It was another year before Final Cut Pro was released by Apple, who announced the purchase from Macromedia about three weeks after NAB 1998.